Ming furniture achieved lofty international acclaim for its subtle beauty and graceful form. Furniture came to represent something higher: the harmony between man and nature, and the union of distinctly Chinese values, ethics, philosophy, and aesthetics. 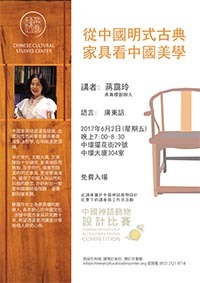 In this talk, Oi Ling Chiang will be exploring what Chinese aesthetics is, through the study of Chinese antique furniture. The talk will be in Cantonese. 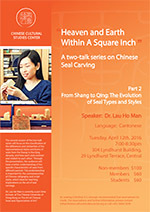 The second session of the two-talk series by Dr. Lau Ho Man will focus on the classi¬fication of the differences and similarities of the representational styles and forms of seals from the Shang to the Qing dynasty, and how each style evolved and related to each other. Through the presentation, the audience will have a better understanding of the specific characteristics of seals from different periods. This understanding is important for the connoisseurship of Chinese calligraphy and script styles, which have far-reaching implications on the art of seal carvings. 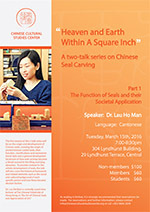 The first session of this 2-talk series by Dr. Lau Ho Man will be on the origin and development of Chinese seals, covering the origin of ancient bronze-casted seals, their function, classifications and representational style and a general developmental picture of how seal carvings became a literati pursuit in the Ming and Qing dynasties. To provide context for the artistic development of seals, the talk will also cover the historical framework and related elements such as the social and cultural background of each specific period and how these became decisive factors.